Germany is to open up a huge archive of Nazi records on concentration camp inmates and slave labourers, ending a long-running dispute. Justice Minister Brigitte Zypries announced the move during a US visit. The files contain detailed information about more than 17 million people who went through the concentration camp and slave labour system. Until now, Germany had resisted international pressure to allow access, citing privacy considerations. The files are locked up at a former SS barracks in Bad Arolsen in central Germany. 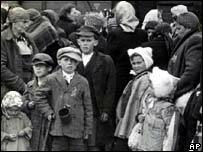 The International Red Cross has used the files to help trace people for relatives who lost contact during the war. It still gets around 150,000 requests a year. Over several years, there has been growing pressure to open the archive for historical research and for survivors to have direct access. The US and UK have pushed for the files to be opened, as have Jewish groups, but Germany has always resisted, citing privacy considerations. The files contain details ranging from the results of lice inspections to the possession of insurance policies. Germany had feared that it would be the target of legal action if this information became public. These concerns seem now to have been put to rest. It is not expected that the opening of the archives will have major legal implications because the deadlines set for international class action lawsuits have now passed. The decision to open the archive can now be formally approved in May when representatives of the 11 countries which are responsible for it next meet.